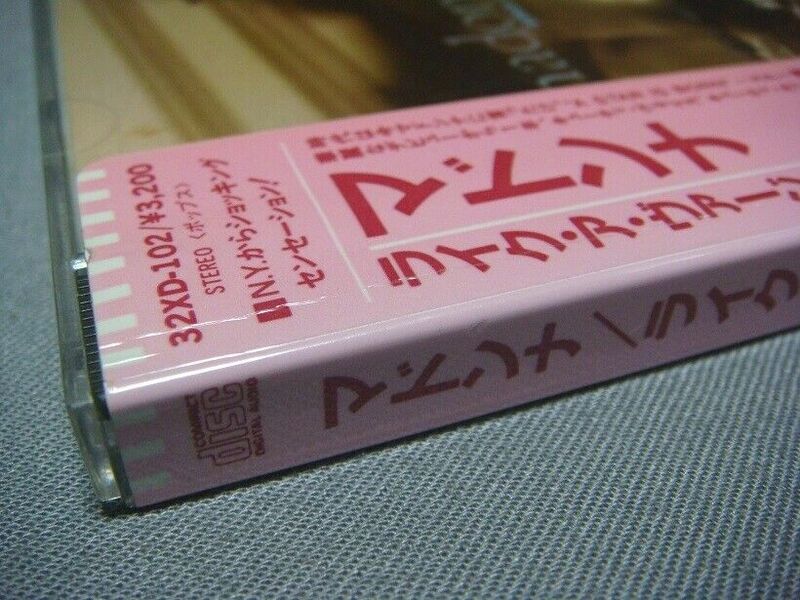 MADE IN | | JAPAN, CSR COMPACT DISC embossed three times in the plastic center (a). "CSR" stands for CBS/ Sony Records. This is atually the second Japanese issue with this catalog numer. 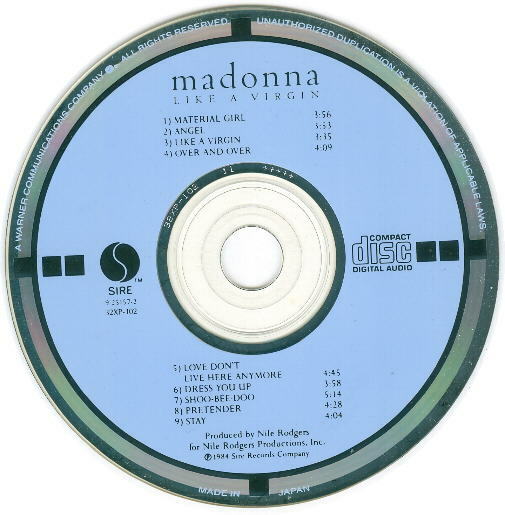 see the listing for the West German target CD. as there were at least fifteen distinct pressings! Some of these pressings have very minor differences. This is trainspotting at its finest! Or worst, depending on your viewpoint. From this point on, things start getting hairy! I will try to list them in chronological order as much as is possible. I would love to hear from them. different upper hemisphere perimeter wording styles, which are very similar at first glance. and NO period after the word "JAPAN" at 6 o'clock. This is the same style used on the 32XP disc. and there IS a period after the word "JAPAN" at 6 o'clock. Got it? Okay! Here we go! There will be a test next Friday! This, and the next thirteen disc variations were pressed by CSR. 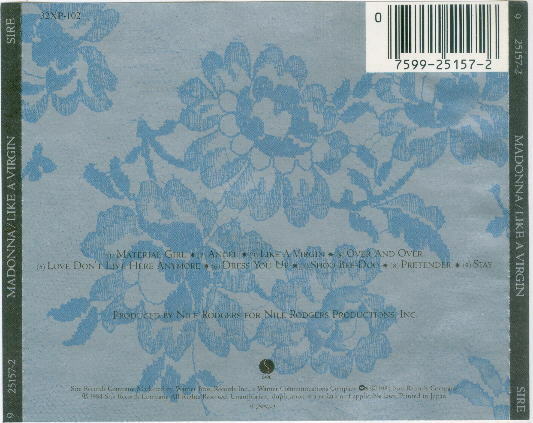 Note here that the US catalog number, 9 25157, appears under the Sire logo. The matrix number on this copy is 32XD-102 11A3 +++++. (b) Matrix: 32XD-102 11A2 +++++ ; US number under logo; perimeter style (r); nothing embossed in plastic center. 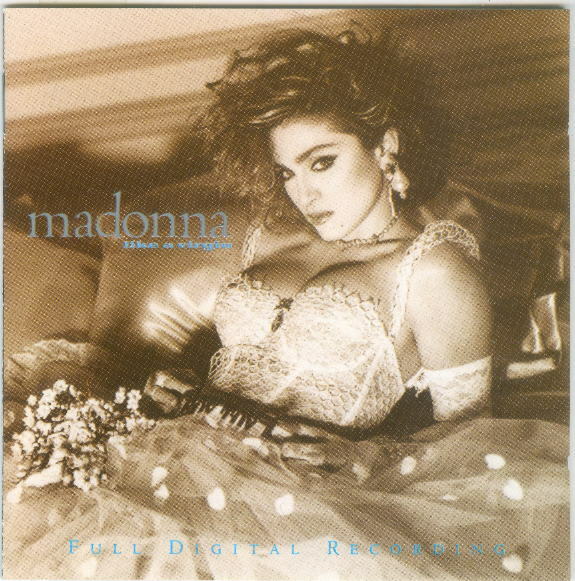 (c) Matrix: 32XD-102 11A3 +++++ ; US number under logo; perimeter style (s); CSR COMPACT DISC (X3) embossed in plastic center. (d) Matrix: 32XD-102 11A3 +++++ ; US number under logo; perimeter style (s); nothing embossed in plastic center. (e) Matrix: 32XD-102 11A3 +++++ ; US number under logo; perimeter style (r); nothing embossed in plastic center. (f) Matrix: 32XD-102 11A5 +++++ ; US number under logo; perimeter style (r); nothing embossed in plastic center. (g) Matrix: 32XD-102 11A6 +++++ ; US number under logo; perimeter style (s); nothing embossed in plastic center. (h) Matrix: 32XD-102 11A6 +++++ ; US number under logo; perimeter style (r); nothing embossed in plastic center. (i) Matrix: 32XD-102 11A7 +++++ ; US number under logo; perimeter style (s); nothing embossed in plastic center. (j) Matrix: 32XD-102 11A7 +++++ ; US number under logo; perimeter style (r); nothing embossed in plastic center. (k) Matrix: 32XD-102 11A7 +++++ ; no US number; perimeter style (r); one small CSR embossed in plastic center. (l) Matrix: 32XD-102 11A7 +++++ ; no US number; perimeter style (s); nothing embossed in plastic center. (m) Matrix: 32XD-102 11A8 +++++ ; no US number; perimeter style (r); nothing embossed in plastic center. (n) Matrix: 32XD-102 11A8 +++++ ; no US number; perimeter style (r); one small CSR embossed in plastic center. (o) Matrix: 32XD-102 11A8 +++++ ; no US number; perimeter style (r); one small CSR embossed in plastic center plus barcode-like lines. I would not be terribly surprised if there are more disc variations out there somewhere. MADE IN | | JAPAN, (l). Wrapping up our discussion of disc variations is: (p) Pressed by EMI / Toshiba; Matrix: 32XD-102 1A1 TO; no US catalog number on the disc. There. That wasn't so bad, was it? 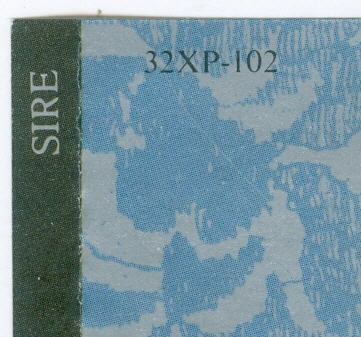 Page eleven states "Printed in Japan"
Disc variation (a) comes with a booklet that has a catalog number 32XP-102 on page twelve. Disc variations (b) through (p) come with a booklet that has a catalog number 32XD-102 on page twelve. This title was issued with a Japanese lyric insert. Rear tray insert "Printed in Japan." with barcode and 32XP-102 in top left corner. Disc variation (a) comes with this rear tray card. An enlargement of the top left corner. Rear tray insert, "Printed in Japan" with barcode and 32XD-102 in top left corner. Disc variations (b) through (p) come with this rear inlay. ... and a partial side view. turns up on eBay, from sellers in Japan. The 32XP variation appears to be quite scarcer.